Don't know what to buy that Special One for Christmas? Great Art is timeless and this one is Christmas priced. 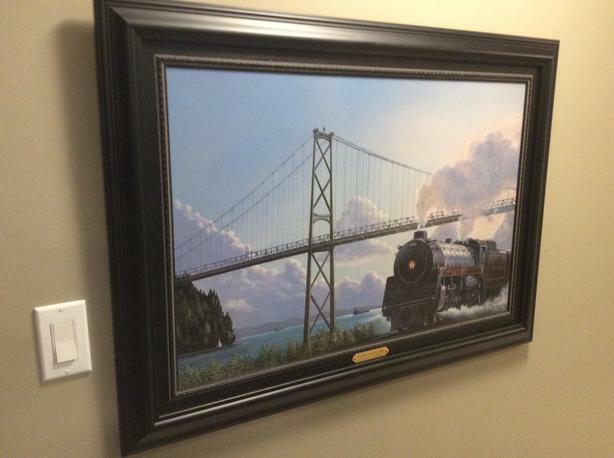 The "Royal Hudson Under the Lion's Gate Bridge" on Giclee` Canvas is # 66 of only 300 produced. Max Jacqiuard is a very coveted B.C. Artist that has an amazing talent to bring colour and life to his paintings. This piece is professionally framed and comes with a C.O.A. Have several others including some Fred Buchwitz at ridiculously low prices as we have moved to the Victoria area and they no longer fit in our new home. An opportunity to purchase some very high end Art at very low prices. Our loss is your gain on these.